At Mills College, you’ll be inspired to expand your thinking and realize your full potential. 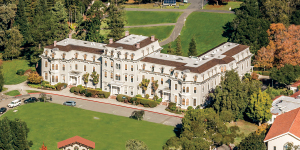 Located in the heart of the San Francisco Bay Area, Mills College is situated 24 kilometers from San Francisco and 10 kilometers from downtown OAKLAND, CALIFORNIA. From our safe, park-like campus, students can connect with innovative employers in the arts, sciences, and technology and enjoy the region’s natural beauty and vibrant cultural life. Type of SCHOOL: Founded in 1852, Mills is a top-ranked, independent liberal arts and sciences college for undergraduate women with graduate programs for women and men. Size of campus: Mills is located on 54.6 hectares amid rolling hills and century-old eucalyptus trees. Colleges, Programs, and Degrees: Mills offers more than 45 undergraduate majors and minors, pre-professional programs in Pre-law and Medicine/Health Sciences, plus partner programs in Engineering and Pre-nursing. Mills offers more than 10 accelerated degree programs, enabling students to earn a bachelor’s and master’s degree with just one extra year of study. Students can also enroll in courses at 13 neighboring institutions—including the University of California, Berkeley—through our cross-registration program. Geographic diversity: Students come to Mills from 15 countries and 41 US states. International student services: Services for international students at Mills include admission counseling, personalized academic advising, and a dedicated international student advisor to assist with orientation to life in the United States, maintenance of visas, and connecting to campus resources. Financial aid: International students are eligible for merit scholarships from Mills based on their academic accomplishments. To be considered for merit scholarships, you must submit the required application documents by our Regular Decision deadline. These scholarships can total up to $10,000 and can be renewed annually. Test score requirements: Providing your SAT and ACT score reports is optional when applying to Mills. Our English-language proficiency requirement may be waived for international students who earn a score of 600 or above on the Critical Reading portion of the SAT. Visit mills.edu/applyundergrad to learn about additional methods of satisfying the English-language proficiency requirement. At Mills College, you’ll find the freedom and support you need to pursue your passions. Founded in 1852, Mills is ranked one of the top colleges in the West by U.S. News & World Report and one of the best colleges in the nation by The Princeton Review. Here you’llbe encouraged to ask questions anddig deep for answers. You’ll discoverthe power of your voice so you canspeak up and make a difference for the ideals and people that matter to you. At the heart of a Mills education isthe personal attention that leads toextraordinary learning. MPOWER,the signature undergraduate experience at Mills, is designed aroundyou: helping you discover and realize your dreams and equipping you to learn and lead. You’ll start your educational journey at Mills with a personal academic success team who will guide you throughout the course of your studies. You’ll dive into experiential learning and study away opportunities that expand your learning and get you even more involved in the world. You’ll put your passions into practice with a one-of-a-kind faculty-mentored project that showcases your individual interests, and our career services team will help you connect your passions to real-world internships and career preparation. One of the country’s most diverse liberal arts and sciences colleges, Mills offers many ways for you to make life-long friends and gain collaborative leadership skills. On campus, you can choose from more than 40 student-run organizations (or start your own); try out for one of our varsity sports teams—cross-country, rowing, soccer, swimming, tennis, or volleyball; and live in a themed housing community where hall mates share a common interest. Off campus, you’ll have all the San Francisco Bay Area has to offer at your fingertips—from outdoor adventures to world-class museums. A global center of innovation, the Bay Area also provides opportunities for students to gain hands-on work experience at a range of international organizations and innovative start-up companies. We want a life-changing Mills education to be within reach of academically talented students from around the globe, so in fall 2018, we lowered our tuition by 36%. Our goal is to make Mills as accessible and affordable as possible to students of all backgrounds. Our 25,000 alumnae are blazing trailsevery day in over 60 countries. Someof them are pursuing advanced degrees at the world’s most prestigiousuniversities; others are leading nonprofits and businesses and pushingboundaries in the arts and sciences. A select group of graduates serves ingovernment—including the United States House of Representatives and inthe diplomatic corps of nations such as Saudi Arabia and Jordan. Wherever you choose to go next, you’ll be equipped to forge a distinctive path, emboldened to transformthe world, and empowered to makea statement.